Lots of different seals crop up in a life, from Easter seals that signify a contribution to a worthy cause to government seals that confirm the truth of a document. Where does this one fit in? Having believed, you were marked in him with a seal, the promised Holy Spirit . . . But this is a different kind of seal, this Holy Spirit seal. This one speaks to a completion as well as a promise. This seals says I am a believer, a follower of the Christ whose sacrifice I accept as mysteriously having the power to forgive my sins irrespective of time (yesterday, today and forever). The seal also represents the promise of my response to the transaction. I am marked to continue in the faith. I agree to work with the inner Spirit and to allow that Spirit to direct my life. The Church (that includes me as individual) is referenced as the bride of Christ [Revelation 21:9-10] . This makes perfect sense to me. 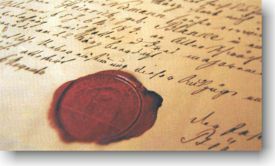 The seal is a representation of a contract, a marriage, if you will. This marriage is also referred to as “becoming ONE.” [Matthew 19:4-6] In marriages we have both the legal contract (the license or pre-nuptial agreement) and the symbolic seals like the rings, the kiss, the sharing of “bread’ (cake). All of these are visible signs of our promises. What is the Holy Spirit’s visible sign? How do we recognize the seal . . . in ourselvces or in others? Some people mistakenly think it’s the wearing of religious icons or jewelry. Some think it’s the show-up rate at a church while others think it’s that 10% tithe. Personally, I think the mark is within. It’s engraved on the heart and is revealede through the eyes. The more transparent and authentic we are, the more visible the mark of the seal. I wholeheartedly agree with you Irm, that the seal you spoke of is an inside job, and can’t be hidden when it is genuine. So often, I have spoken with a stranger and wondered if maybe they might be a believer, because of something I perceived; something in their eyes or their tone of voice. Sometimes I ask and so far, I have always gotten an affirmative that indeed, they are a sister or brother in the Lord. How exciting to know we will have the opportunity to get to know them in eternity! Loved the song too! Thanks for sharing it. It made me cry as it reminded me of my sweetheart! Thanks. I pray for the ability to see not only the marked heart but the kernel of spirit in the hearts of all. If I could engage that kernel, then love for everyone is possible. It’s a looking that I am not very good at . . . but one I feel God is calling us to. I wish I could have found a better version of that song. But it’s pretty old. A old friend cross-stitched the chorus for me and it hangs over my desk at work . . . a reminder, a hope.